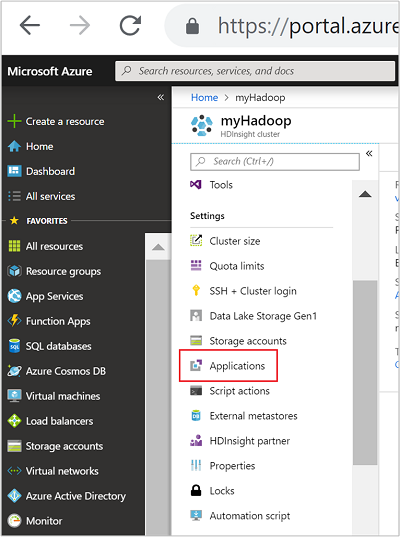 Learn how to install a third-party Apache Hadoop application on Azure HDInsight. For instructions on installing your own application, see Install custom HDInsight applications. An HDInsight application is an application that users can install on an HDInsight cluster. These applications can be developed by Microsoft, independent software vendors (ISV) or by yourself. AtScale Intelligence Platform Hadoop AtScale turns your HDInsight cluster into a scale-out OLAP server, allowing you to query billions of rows of data interactively using the BI tools you already know, own, and love – from Microsoft Excel, Power BI, Tableau Software to QlikView. CDAP 4.2, 4.3 for HDInsight HBase CDAP is the first unified integration platform for big data that accelerates time to value for Hadoop and enables IT to provide self-service data. Open source and extensible, CDAP removes barriers to innovation. Requirements: 4 Region nodes, min D3 v2. Datameer Hadoop Datameer’s self-service scalable platform for preparing, exploring, and governing your data for analytics accelerates turning complex multisource data into valuable business-ready information, delivering faster, smarter insights at an enterprise-scale. Dataiku DSS on HDInsight Hadoop, Spark Dataiku DSS in an enterprise data science platform that lets data scientists and data analysts collaborate to design and run new data products and services more efficiently, turning raw data into impactful predictions. WANdisco Fusion HDI App - 2.12.3, 2.12.1, 2.11.2 Hadoop, Spark,HBase,Storm,Kafka Keeping data consistent in a distributed environment is a massive data operations challenge. WANdisco Fusion, an enterprise-class software platform, solves this problem by enabling unstructured data consistency across any environment. H2O SparklingWater for HDInsight Spark H2O Sparkling Water supports the following distributed algorithms: GLM, Naïve Bayes, Distributed Random Forest, Gradient Boosting Machine, Deep Neural Networks, Deep learning, K-means, PCA, Generalized Low Rank Models, Anomaly Detection, Autoencoders. Striim for Real-Time Data Integration to HDInsight Hadoop,HBase,Storm,Spark,Kafka Striim (pronounced "stream") is an end-to-end streaming data integration + intelligence platform, enabling continuous ingestion, processing, and analytics of disparate data streams. Jumbune for HDInsight Hadoop, Spark At a high level, Jumbune assists enterprises by, 1. Accelerating Tez, MapReduce & Spark engine based Hive, Java, Scala workload performance. 2. Proactive Hadoop Cluster Monitoring, 3. Establishing Data Quality management on distributed file system. Kyligence Enterprise Hadoop,HBase,Spark Powered by Apache Kylin, Kyligence Enterprise Enables BI on Big Data. As an enterprise OLAP engine on Hadoop, Kyligence Enterprise empowers business analyst to architect BI on Hadoop with industry-standard data warehouse and BI methodology. Spark Job Server for KNIME Spark Executor Spark Spark Job Server for KNIME Spark Executor is used to connect the KNIME Analytics Platform to HDInsight clusters. Starburst Presto on Azure HDInsight, Starburst Presto (v0.213-e) Hadoop Presto is a fast and scalable distributed SQL query engine. Architected for the separation of storage and compute, Presto is perfect for querying data in Azure Data Lake Storage, Azure Blob Storage, SQL and NoSQL databases, and other data sources. StreamSets Data Collector for HDInsight Cloud Hadoop,HBase,Spark,Kafka StreamSets Data Collector is a lightweight, powerful engine that streams data in real time. Use Data Collector to route and process data in your data streams. It comes with a 30 day trial license. Trifacta Wrangler Enterprise Hadoop, Spark,HBase Trifacta Wrangler Enterprise for HDInsight supports enterprise-wide data wrangling for any scale of data. The cost of running Trifacta on Azure is a combination of Trifacta subscription costs plus the Azure infrastructure costs for the virtual machines. Unifi Data Platform 3.1 Hadoop,HBase,Storm,Spark The Unifi Data Platform is a seamlessly integrated suite of self-service data tools designed to empower the business user to tackle data challenges that drive incremental revenue, reduce costs or operational complexity. Unraveldata APM Spark Unravel Data app for HDInsight Spark cluster. Waterline Data Catalog Spark Waterline catalogs, organizes, and governs data using AI to auto-tag data with business terms. Waterline’s business literate catalog is a critical, success component for self-service analytics, compliance and governance, and IT management initiatives. The instructions provided in this article use Azure portal. You can also export the Azure Resource Manager template from the portal or obtain a copy of the Resource Manager template from vendors, and use Azure PowerShell and Azure Classic CLI to deploy the template. See Create Apache Hadoop clusters on HDInsight using Resource Manager templates. The following procedure shows you how to install HDInsight applications to an existing HDInsight cluster. From the left menu, navigate to All services > Analytics > HDInsight clusters. Select an HDInsight cluster from the list. If you don't have one, you must create one first. see Create clusters. Under the Settings category, select Applications. You can see a list of installed applications in the main window. Select +Add from the menu. You can see a list of available applications. If +Add is greyed out, that means there are no applications for this version of the HDInsight cluster. Select one of the available applications, and then follow the instructions to accept the legal terms. You can see the installation status from the portal notifications (select the bell icon on the top of the portal). After the application is installed, the application appears on the Installed Apps list. You have the option to install HDInsight applications when you create a cluster. During the process, HDInsight applications are installed after the cluster is created and is in the running state. To install applications during cluster creation using the Azure portal, you use the Custom option instead of the default Quick create option. The portal shows a list of the installed HDInsight applications for a cluster, and the properties of each installed application. Select an HDInsight cluster from the list. Webpage The URL of the web application that you have deployed to the edge node. The credential is the same as the HTTP user credentials that you have configured for the cluster. SSH endpoint You can use SSH to connect to the edge node. The SSH credentials are the same as the SSH user credentials that you have configured for the cluster. For information, see Use SSH with HDInsight. To delete an application, right-click the application, and then click Delete from the context menu. You can connect to the edge node using HTTP and SSH. The endpoint information can be found from the portal. For information, see Use SSH with HDInsight. The HTTP endpoint credentials are the HTTP user credentials that you have configured for the HDInsight cluster; the SSH endpoint credentials are the SSH credentials that you have configured for the HDInsight cluster. Install custom HDInsight applications: learn how to deploy an unpublished HDInsight application to HDInsight.